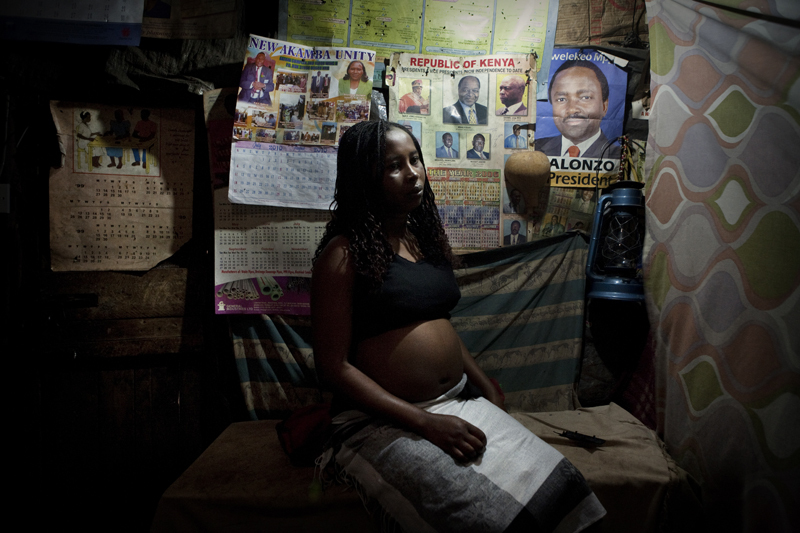 KIBERA SLUM – JULY 29: A 20 year old Kenyan woman who is 6 months pregnant sits in a midwifes house in the slum of Kibera in Nairobi, Kenya on July 29th, 2010. Her father, the main bread winner in her family passed away 3 years ago. She lives with her mother, 2 brothers and 3 sisters in a one-room shack in Kibera; they can barely afford to pay the rent each month. Her boyfriend abandoned her when he found out that she was 2 months pregnant, she is due October 3rd. Due to lack of family planning in Kenya, many women are left to raise children alone without any means of an income. She says that her culture believes if you abort your first pregnancy then you will become barren and never have children so she plans to keep her baby. "Feeding my baby will be a problem, it won't eat a balanced diet."